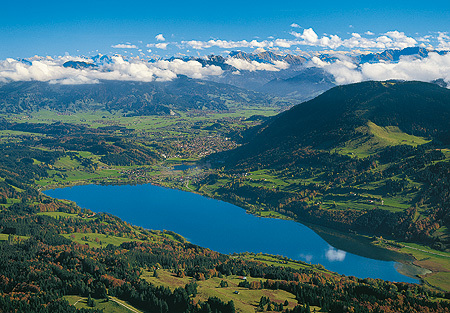 The Große Alpsee is one of the most attractive parts of the Allgäu. With an area of around two-and-a-half square kilometres and a length from east to west of around three-and-a-half kilometres, it is the largest natural lake in this region. It extends along the narrow valley of the Konstanzer Ach, and is sealed off to the north and south by steep mountain slopes. The second lake on its west side, the small Teufelssee, is all that remains of a bay of the Alpsee which dried up. The whole lakeland area is a nature reserve. The north side of the lake and the ridge, from the ruins of Rothenfels and Hugofels across the Zaumberg, the Thaler-Höhe and the Salmaser-Höhe, are accessible via a number of easy hiking trails. Immenstadt in the Illertal, which rose to importance primarily because of the salt trade, is well worth an excursion. The Große Alpsee, west of Immenstadt, lies directly on the B308 which runs parallel to the Alps.